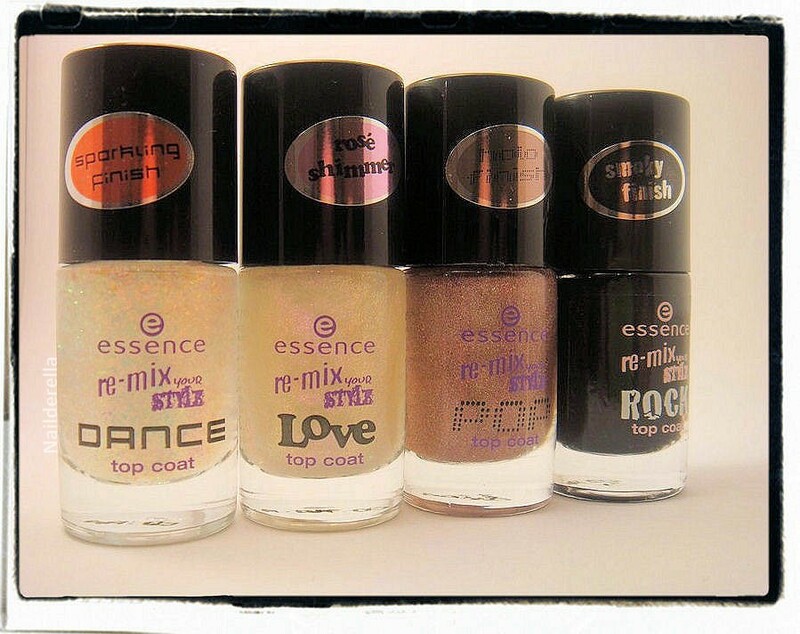 I'm so excited to present you the new Essence Trend Edition called Re-mix your Style. This collection is made of 4 effect top coats and 6 colors. The top coats seemed the most interesting to me. 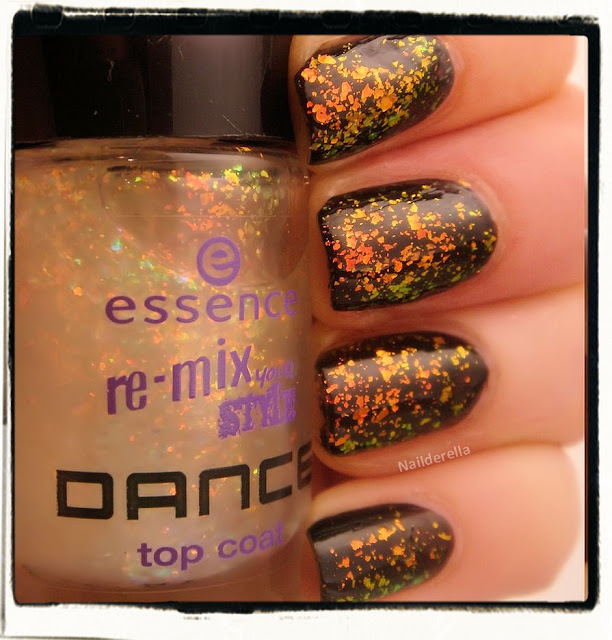 That's why I bought them as well as a back up bottle of "Waking up in Vegas" (flakies) for future franken. I got the idea of the franken while looking at The Swatchaholic. Let's start with the flakies! This lovely one is called 01 Waking up in Vegas and yeah....it contains orange flakies that can switch from yellow to green on the nails according to the light. They are suspended in a clear base. On this picture, I layered 2 coats of Waking up in Vegas over black. As you can see, with 2 coats, it's fairly dense and you can spot the green, yellow and orange color shift. I heard Waking up in Vegas is a dupe for Nubar 2010 or Sally Hansen Hidden Treasure. I don't have any of them so I cannot do any comparison but from what I've seen, they do seem quite close indeed. It's easy to work with this polish, no application problem was encountered. And as the base is clear, you have endless layering possibilies! The bottle contains 8 mL and cost about $3-4. The second one is the LOVE top coat, 01 Feels so Good. 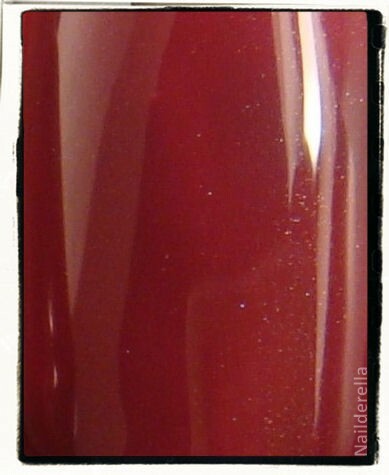 On the label, it's written "Rosé Shimmer" and that's what this polish is supposed to do: give your base color a nice and sparkly pink shimmer. 01 Feels so Good is really amazing and totally unexpected! I tought it was "only" giving your base polish a pink shimmer. However, look at the swatches! You've got some kind of duochrome effect. 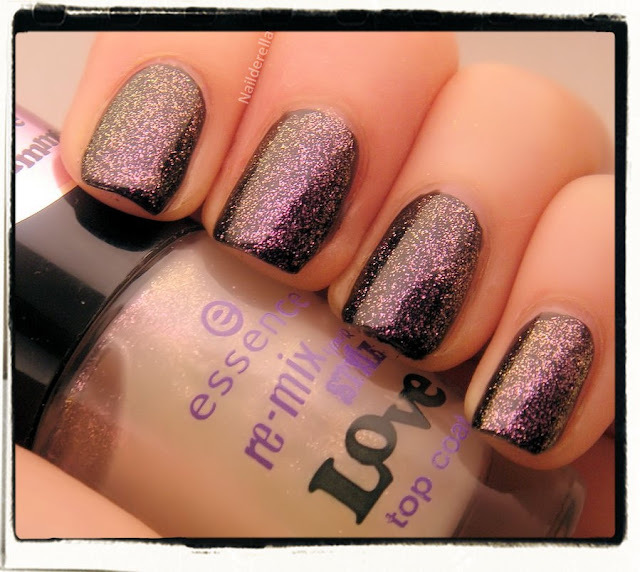 This is not obivous on the nails all the time, it depends on the angle at which light hits your nails. But oh my! When this appears, it looks super interesting! 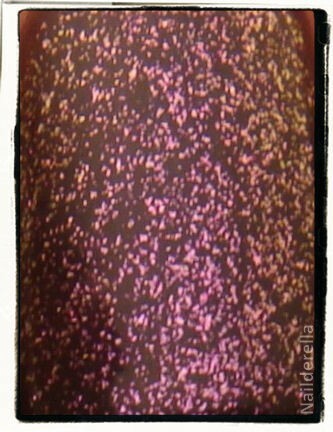 Maybe, what you cannot see on my pictures, it's the really shimmery effect this polish has. It's more glowy than the picture wanna show you. This was 2 coats over black. Again, application was nice. Next is 01 Just can't get enough. It's the POP top coats that is supposed to give, according to the label, a holo finish to your base polish. 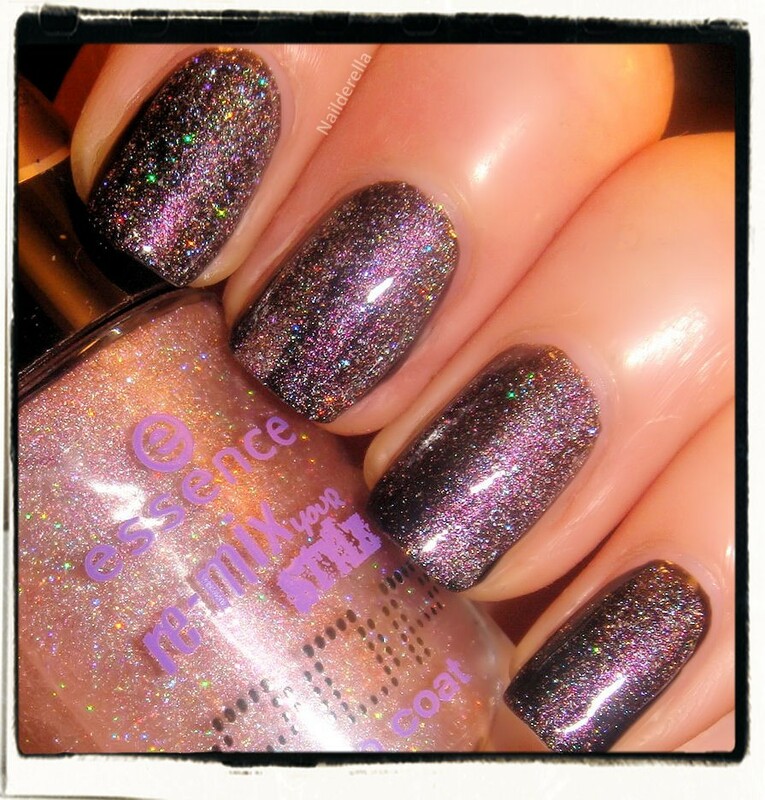 I'm always on the fence when Essence talks about holo because, most of the time, it's not a true holo. So let's take a look at the swatches. 01 Just can't get enough is really holo!! Yay~ The finish is a scattered holo. There are holo particles suspended in a sheer pinkish base. 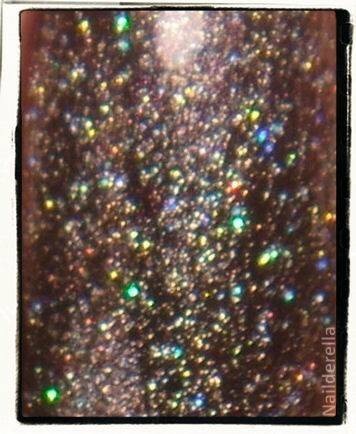 The holo particles are super shiny and it gives a really nice glow on the nails. This was 2 coats over black. Again, nice application. 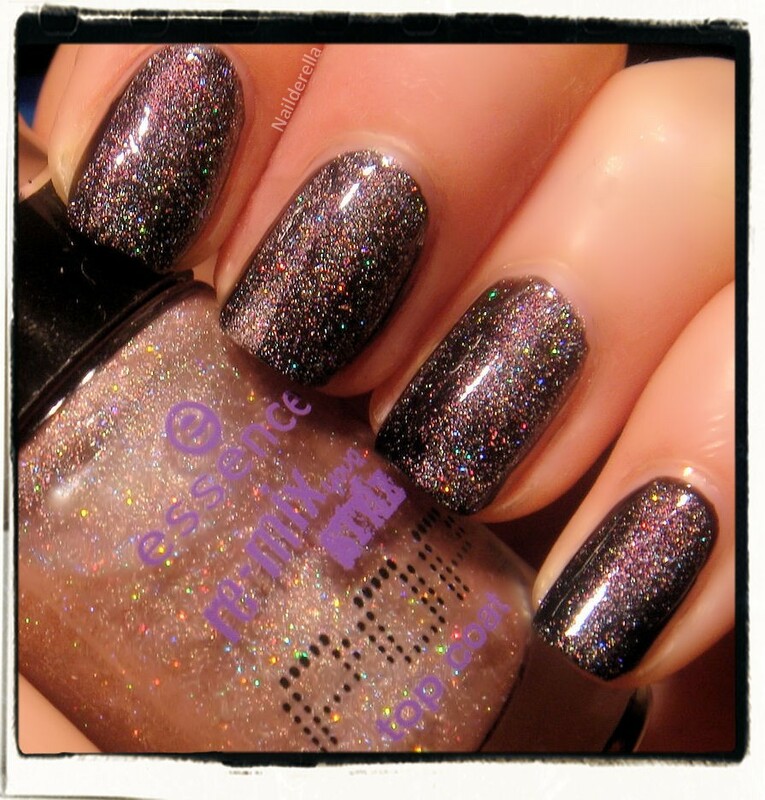 I really love of "spacy" it looks! ;D Galaxy nails! How nice!! 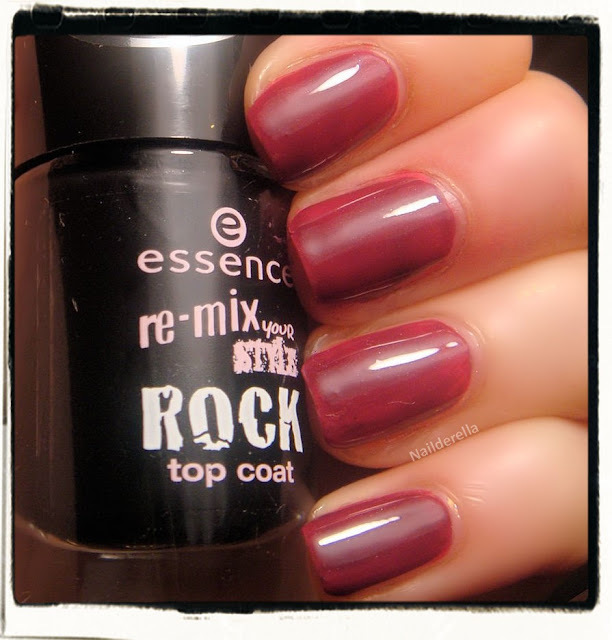 I found that Dior had released last April a Rock Coat Smoky Black Top Coat that gives the same kind of finish...So We will rock you might be a very nice alternative to this expensive Dior polish. 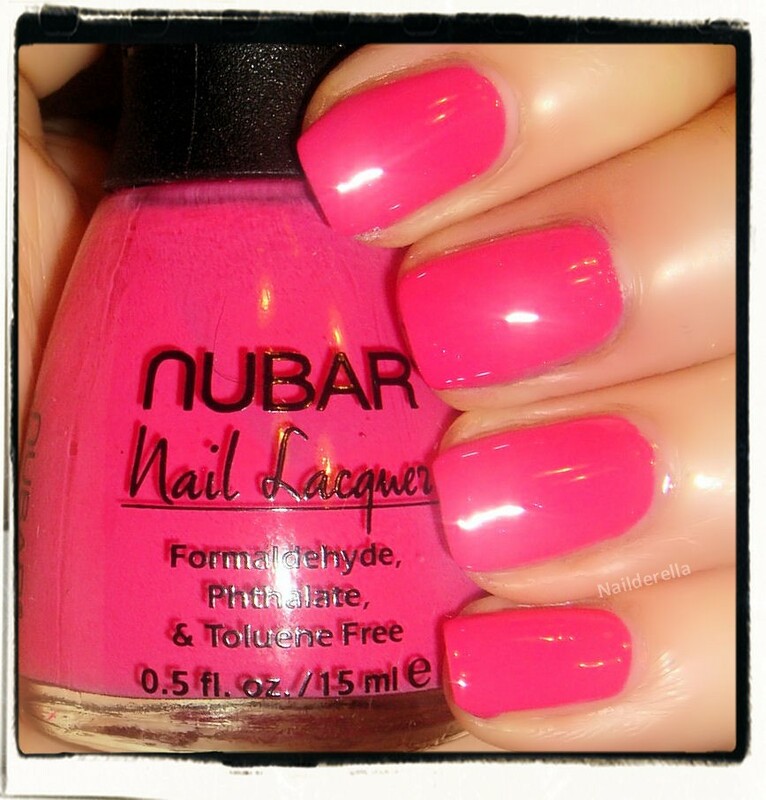 I wanted to show you the effect of this polish over a bright pink. For this purpose, I chose to layer it over Nubar Honeysuckle. Here is what Honeysuckle looks by itself. And now, let's add a thin coat of We will rock you on top. 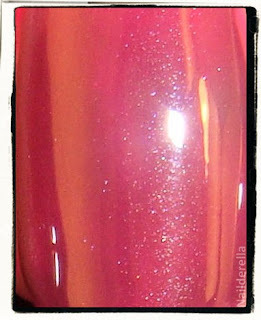 And the bright pink now has a smoky finish! 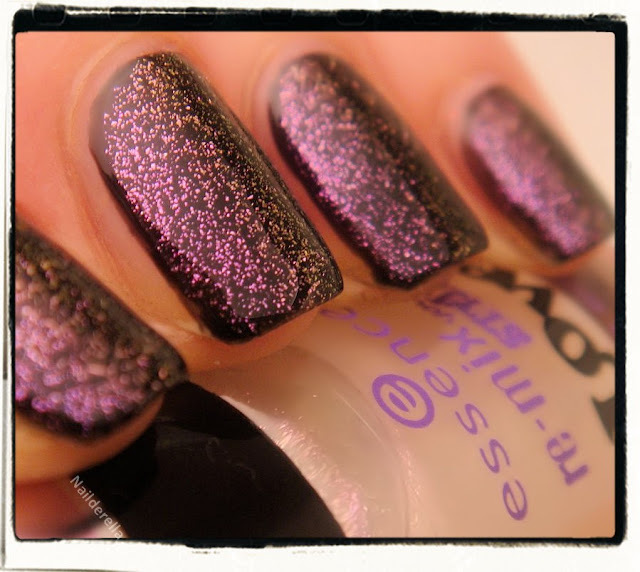 We will rock you is in fact a sheer black and shimmer jelly. I show you 2 close up pictures, one withouth and one with flash because the first one shows you the overall effect the best while the photo taken with flash shows you the really texture of this polish, i.e., the sheer shimmery black jelly. 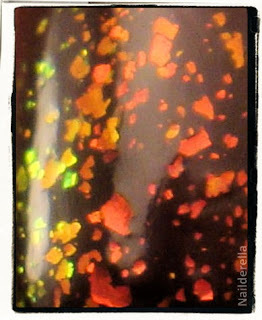 It's more interesting than I thought it would because you can smoke out any polish to spicy up your mani. Application was perhaps a little more difficult than the other top coats of this collection because IMO it looks best when you use a very thin layer, in one single stroke. And if you don't apply the same amount on each nails, some nails will look darker than the others which is not the prettiest IMO again...But when it's done nicely, it looks super pretty! I must admit I'm super happy with this collection. Essence has done an amazing job here. 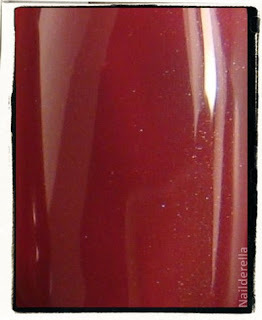 You've got flakies, a holo, a shimmery duochrome, and a funny and vampy smoky finish. How amazing is that!! I was more than surprised with everyone and there are many layering possibilities to enjoy them in different fashions.